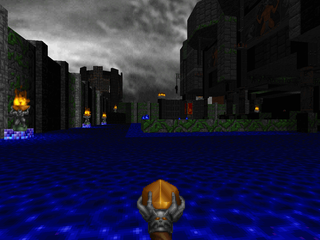 Since id Software released Doom in 1993, thousands of user-made WADS and maps have been and continue to be created for the Doom community's entertainment. These are their stories. No credit where credit is due? If you know the proper credit for a WAD or a link to an author's works where there is no link, contact me with the info and I'll make the correction. Christopher Lutz's Icebound has the dubious distinction of being the first Heretic WAD reviewed on this site (as well as my first Heretic PWAD ever). It has a few more noteworthy aspects... It's the only Heretic WAD featured in the 2011 Cacowards (oh, it won one, too) and was in the running for the Mordeth award (seven years!) until someone pointed out that the 1994 Tune-up Community Project was technically in "development" for seventeen years. Admittedly, that last one seems more like a way to get 1994TU.WAD an honorable mention. Whatever the outcome, Lutz saw fit to thaw this shelved project out, an E1M3 replacement for Boom / MBF compatible ports, and we are the beneficiaries of his dogged persistence. If the title didn't clue you in, Icebound begins with Corvus on a boat trapped in an ice floe outside some appropriately ancient ruins. You'll see a lot of lovingly rendered chunks of frozen water while you traverse the fortress. You'll also see a host of special effects, from 3D bridges to terrific voodoo doll scripts creating an unusually dynamic environment (and silent teleporters!). Finally, Icebound is pretty challenging. I mean, I'm no Heretic expert, but there were several tricky fights that had me reaching for my stock of items (usually too slow to prevent my untimely death). 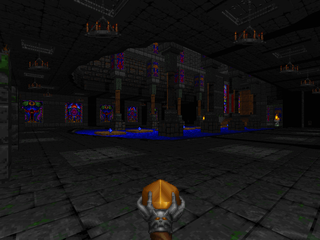 Most of Heretic's bestiary makes an appearance here, excepting the two biggest bads. Outside of secrets (I only found one of seven, a morph ovum) you'll find your ammo and weapon selection pretty restricted. Make judicious use of powerups and the gauntlets. Some standout encounters... The phoenix rod fight is perhaps my favorite sequence. It seems pretty innocuous at first, a central platform in the center of a ring of ice, with a pack of gargoyles and bishops messing with you. Then you activate the switch, causing lava to pour from the ceiling, which replaces the slippery ice with deadly molten rock, also removing the pillars you leaped across to get to the middle platform. Then some more bishops and gargoyles appear, except you're restricted to a small area to dodge, exacerbated by the presence of frozen water on your precarious perch. Finally, shooting the designated switches causes some pillars to fall from the ceiling, allowing you to both grab the phoenix rod and escape from the room. It's very faux-3D and very awesome. The other battles that stand out in my mind are utter brawls. There's one in the northern court, er, yard, which should result in some tricky maneuvering as you strafe around the undead warriors and golems (taking care to dodge attacks from the ramparts). The other is the finale, prompted by an iron lich reveal that puts you in quite the crossfire, complete with two hordes of dragons and sabreclaws. You have to tease these guys out to get at the precious phoenix rod ammo behind them which should make clearing the bishops a breeze. Of course, there's still the risk of succumbing to the lich, but you should be in the clear. The action is pretty linear but it's a treat to explore and experience. One of the more environmental situations has you running across a series of pillars to a switch that, when pressed, unleashes a ton of gargoyles, a few pockets of projectile enemies, and fireball-spewing geysers that make falling to the ground a dangerous proposition. Oh, and it cleverly changes the teleporter destination so that you can't just use it as a shortcut back to the start point. The map as a whole is gorgeously detailed and has excellent architecture. Lutz nails a cohesive theme, with all its water (flowing, frozen, and still) and more organic features contrasted with the more intelligent additions. I know there aren't a lot of Heretic WADs out there, so it's great to see something of this quality put out for one of Doom's slightly younger siblings. 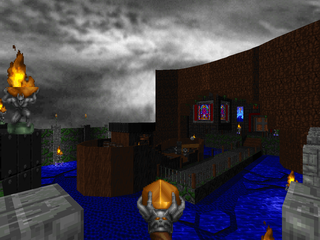 If you love Heretic, you NEED to play this map. 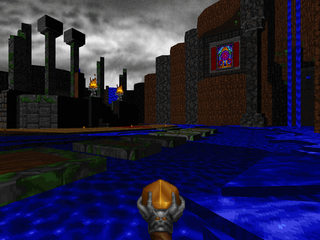 In fact, play this WAD if you like Heretic at all. It's simply fantastic. WERE WE EVER COLDER ON THAT DAY? You're last sentence is dead on. Simply a fantastic map. One of the best I've played for Heretic. Nuff said. 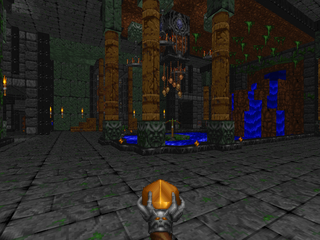 If you have Heretic and haven't already, you should really play kristus' 'Curse of D'sparil'. It's possible the best episode ever made for Heretic and also manages to pack a real punch for difficulty in a game that rarely does. Curse of D'sparil is part of the 2010 Cacoward lineup, which I may visit sooner, rather than plow through all years in between, in the interest of paying homage to what is by most accounts a really great year in Doom authorship. Yes, Curse got viewed so well that a Caco was given to a Heretic wad for the first time ever at that point. And 2010 certainly has plenty of gems, though it's certainly not the only year with that property.